Long Dress & Lacey Top for Genesis 3 Female for use in Daz Studio 4.8+. Movement Handles included. I have also included several Textures. Thanks I will use it in my project. Currently I am not making any single penny from 3D rendering, hence I will donate in future. Grey boxes usually mean you have not installed the item correctly. I suggest you download my tutorial on how to install content. This can be found in the Help & Tutorials Tab to the left. I have had an ongoing problem with downloaded dresses and the like. 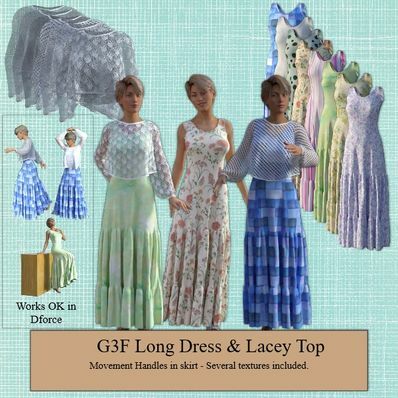 They appear as grey boxes on the figure and I have not been able to locate what the problem is.Anyone help in regard to this, as I can not use dresses apart from purchasing them from Daz site. Thank you. Your work is always top grade. So lovely! Thank you very much! Oh cool! Thank you, thank you, thank you! I love your clothing. And most of it works great with dForce! You're awesome, Wilmap! <3 Thank you! Thank you kindly... can't wait to dress my G3F! Lovely! Thank you for sharing. With a little tweaking it works nicely on G2F with autofit as well! This is very pretty and romantic. Thank you! Wow! Such wonderful textures and love long dress! The Lacey top is to die for!! You are the GREATEST! Thank you so much! Wow! This looks awesome. Can't wait to try it. You always make the most wonderful clothing. Have you thought about doing more Dawn and Dusk things?